In Dorion, near Thunder Bay, you can find more than one way to take your breath away. Lake Superior is a huge lake. At 82,400 sq. km (31,820 sq. mi.) it is in the top three of the world's largest freshwater lakes. 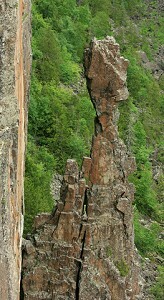 The land you see as you drive the highway around Lake Superior is text book Canadian Shield. Fishing and hunting are popular in the North of Superior Region. Thunder Bay is the largest city in the region and has Lakehead University along with historical sites such as Fort William Historical Park, a reconstructed fur trade post. Thunder Bay is also known as Little Finland; apparently sauna is the only Finnish word in the English language and we all pronounce it wrong. Ouimet Canyon Provincial Park has an unusual geological fault: at it depths it supports the only growth of sub-Arctic plants south of the Arctic Circle. Pukaskwa National Park shows off Canadian Shield topography near Marathon. Kakabeka Falls is 39 m (128 ft.) and is home to some of the world's oldest fossils - and by old, we mean 1.6 billion years. These are just a few of the options available to you in the North of Superior Region. Accommodations north of Superior include hotels, motels, resorts, bed and breakfasts and campgrounds. This Motel is on a main street in the small town of Nipigon. We are a pet friendly facility. We also have ample free parking on site. Enjoy a comfortable and quiet night's sleep in one of our 18 beautiful rooms equipped with complimentary WiFi Internet and flat screen t.v.'s. Plenty of outdoor seating and BBQ for guest use. Our pet-friendly Thunder Bay hotel is walking distance from Arthur Street Marketplace. Our 100% smoke-free hotel include a free full hot breakfast, free high-speed wireless Internet access, drive-up rooms with patio door access, business center and BBQ grills. All guest rooms feature pillowtop beds, stylish bathrooms with granite vanities, 32-inch LCD flat-screen TVs, refrigerators and microwaves. This is an all-suites hotel, perfect for an extended stay in Thunder Bay. Relax and feel at home in the fully equipped kitchen, well designed desk and work area complete with complimentary high-speed Internet access and daily Hot breakfast. There is an indoor pool and hot tub, meeting rooms and fitness facility. Pet friendly. Start your morning with a free continental breakfast, and connect to free WiFi. Free parking makes it easy to get off and on the road. They offer dry-cleaning service and a guest laundry facility for your convenience. Non-smoking rooms are available. This hotel in Thunder Bay offers free WiFi. Start your day with free breakfast and get active in the fitness center. Unwind in our indoor pool or lounge in our Jacuzzi. After you get back from a fun-filled day, enjoy a meal at a nearby restaurant. At this motel in Thunder Bay, WiFi is available in all areas and is free of charge and continental breakfast is offered. This waterfront Thunder Bay hotel (built in 1911) offers free shuttle to/from Thunder Bay International Airport (20 minutes away). The traditionally styled rooms include a fridge and coffee-making facilities as well as cable TV and in-room movies. The hotel features on-site dining, an indoor heated pool and guest rooms with free Wi-Fi. A fitness centre is available, along with a hot tub and sauna. We are determined to offer the best customer service for both business and leisure travelers. This Thunder Bay hotel offers convenient access to skiing and fishing as well as a variety of local shops and restaurants. Only minutes from Thunder Bay, this charming B&B is a peaceful retreat, surrounded by forest and close to lakes. Three comfortable rooms, all with ensuite and many amenities including, coffee pot, microwave, small fridge, TV and hi-speed internet. Room rates range from $60 - $90. Wake up to a wonderful home cooked breakfast served in our spacious sunroom, where you can view birds and wildlife. This Inn in Thunder Bay offers rooms with kitchenettes and single, twin and double rooms. Rooms have air conditioning, microwave and fridge. Free wireless and local calls. Cable TV, complimentary coffee and newspaper. Pet friendly. Best Western Thunder Bay Crossroads offers pet-friendly accommodations in Thunder Bay. At this motel in Thunder Bay, WiFi is available in all areas and is free of charge. Free private parking is available on site (reservation is not needed). Pets are allowed on request. Family rooms and air conditioning. Non-smoking rooms, 24-Hour front desk and daily housekeeping. This Motel in Thunder Bay offers free Wifi, cable TV and rooms include a microwae, toaster, fridge and coffee machine. Some rooms have a kitchenette. Laundry facilities on site and a BBQ area for guests. This Thunder Bay hotel provides easy access to many local attractions, including Thunder Bay Charity Casino, Soroptimist International Friendship Gardens park and Centennial Botanical Conservatory, featuring countless exotic flowers, trees, shrubs and other plants from around the world in a year-round tropical setting. We are conveniently located five minutes South of Thunder Bay International Airport and nestled in the Nor'Wester Mountains. Also, the hotel is only minutes away from these attractions: Chippewa Park, Fort William Historical Park and prestigious golf clubs. This Thunder Bay hotel is located 1 km from Thunder Bay International Airport and specializes in hosting conventions and social events. Provides free airport shuttle services and Wi-Fi. Features an indoor pool, hot tub, sauna and gym. The River Rock Bar and Grill is open daily for breakfast, lunch and dinner. Located 4.5 km from Thunder Bay Museum and Northwestern Ontario Sports Hall of Fame. Located a 2-minute drive from Thunder Bay International Airport, this hotel features an indoor pool with a water slide, jacuzzi, gym, and restaurant. It offers free airport shuttles and Wi-Fi. Each room has flat-screen cable TV and free DVD rentals. Has 15000 sf of convention space. Within a 10-minute drive of Confederation College, Fort William Historical Park and Lake Superior. This hotel in Thunder Bay offers complimentary breakfast and free wifi. Coffee and tea, and all the in-room conveniences that make you feel right at home, even when you’re away. Our Thunder Bay hotel offers a clean and comfortable room at an affordable rate. Our spacious guest-rooms include an in-room coffee/tea maker, in-room hairdryer, and remote controlled cable television. We are located near the Canada Games Complex, Port Arthur Arena and Stadium, Community Auditorium, Old Fort William, Kakabeka Falls and the Intercity Shopping Mall. At this hotel in Thunder Bay, make the most of free high-speed Internet, and get energized for a busy day with a free breakfast. For your convenience, rooms are equipped with microwaves and refrigerators, and our hotel features laundry facilities and dry cleaning services. Accessible rooms are available. This new, five-story hotel in Thunder Bay offers amenities for a comfortable stay including a free hot breakfast buffet, free WiFi and airport shuttle service. Choose a suite for more space and separate living area. Rooms offer a mini-fridge, microwave and sofa bed. Swim at the indoor pool and get in a workout at the fitness center.